With my beautiful cousin sister Ruchi visiting with her lovely husband and her new delectable and bouncy little baby girl (whom I had the pleasure to name! ), I had to come up with a nice Sunday dinner idea which was not too time consuming so we could still hang out and do things outside the kitchen and home! This simple recipe was just what I was looking for. It would also be really great with lamb or chicken too I think. It really turned out superb with all the garlicky herb mix and meat baking away to creating the most glorious smells which really got the appetites going. The pork turns out really moist, juicy and full of flavor. This is a great dish perfect for family lunches or dinners when you want something special but don’t want to live in the kitchen for hours on end. 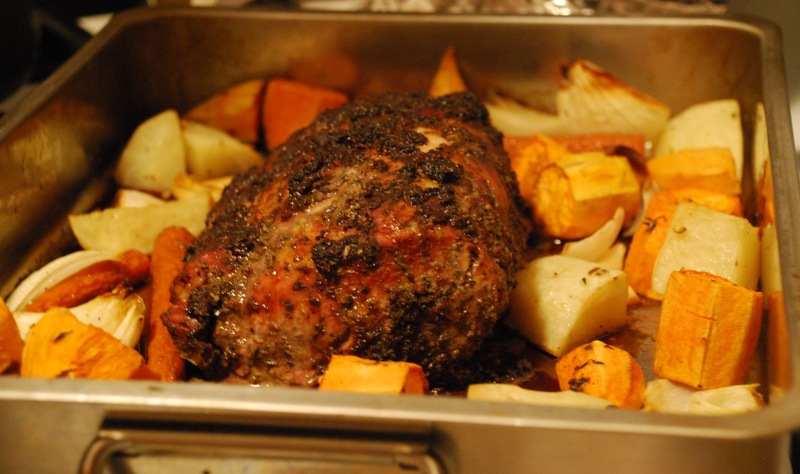 You really don’t need to spend more than 15 minutes to get your roast in the oven. Then its just a matter of baking for little over an hour and getting your sauce ready as the baking time nears its end. You could make the sauce earlier and just warm through before serving if your prefer. The best bit of the weekend: Ellora falling asleep on me, cheek to cheek! Preheat oven to 175 C or 350 F.
Blend in a food processor the garlic, herbs and mustard and soy sauce, to make a paste. Rub this all over your pork and place in the roasting tin. Place vegetables and whole garlic cloves in a large bowl, drizzle with olive oil, salt and pepper and fresh thyme leaves. Mix with your fingers and place around the pork in the roasting tin. Bake for 60 to 70 minutes or till the juices run clear. Place the pork loin on a serving platter and carve. Pour the remaining juices in the tin all over the pork. Every drop of these is precious! When your pork is nearly done, heat butter in a saucepan, add the onions and cook for a few minutes till softened. Add the flour and stir around, cook for a minute. Add your chicken stock and stir, the sauce will get thicker. Now add the sour cream and the horseradish. Cook on low heat for 2-3 minutes. Taste and adjust the seasonings and serve.